Preparing and cooking this chicken fajita recipe is easy and quick if you have chicken leftovers from your roast dinner or just cooked chicken, even if you don't it will not take long to marinate and cook the chicken. There are 258 calories and 5g of net carbohydrates per serving. Recipe Nutritional Profile: Diabetes Appropriate, Healthy Weight, Heart Healthy, High Protein, Low Calories, Low Carbs, Low GI, Low Saturated Fat, Low Sodium, Good Source of Vitamin A, Vitamin B-6, Vitamin C, Niacin, Phosphorus and Selenium. 12 baby romaine lettuce leaves. Wash and cut the chicken into long strips and place the meat into the marinade and soak for 1 hour at room temperature or overnight in the fridge. Heat 1 tbsp. of olive oil on a high heat in a nonstick frying pan. Throw in the onion and bell pepper and fry them till soft and lightly golden. Transfer the onions and peppers onto a pepper towel to absorb the oil. Keep warm. Put the marinated chicken under a hot grill and cook for 10 min on each side. 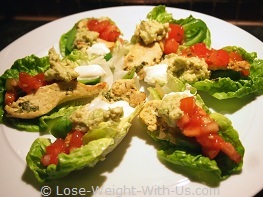 Lay 6 baby romaine lettuce leaves on each plate and top them up with chicken, guacamole, sour cream, salsa, onion and the bell peppers.